Voacanga (Voacanga Africana) seeds to cultivate your own Voacanga tree. 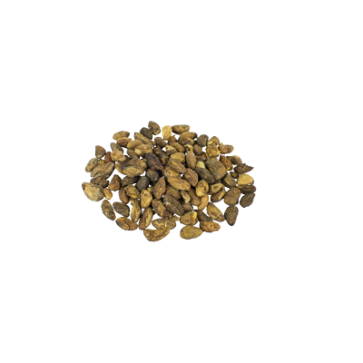 The seeds and bark of Voacanga contain the psychoactive substances voacangine and voccamine. These substances have stimulating, performance enhancing effects and can cause hallucinations in high doses. Sorcerers in West Africa use the seeds to induce visions. 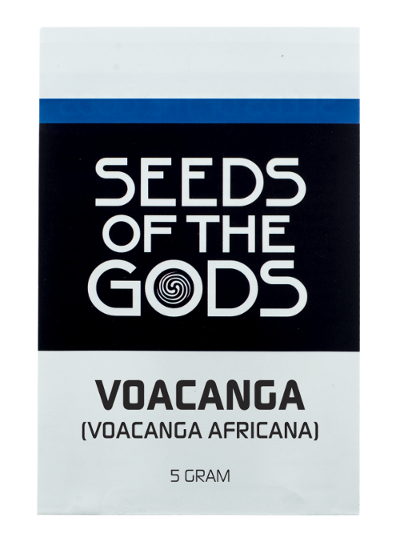 Contains 5 grams of Voacanga Africana seeds. In hermetically sealed packaging. The seeds and bark of the African tree Voacanga Africana contain the psychoactive alkaloids voacangine and voccamine. These substances can cause hallucinations and work as an aphrodisiac. They also contain stimulating effects: these substances increase your heart rate, making you alert and awake. The chemical structure of voacangine and voaccamine resembles ibogaine, found in the Iboga shrub native to Central Africa. Ibogaine is an hallucinogen that according to some has an ‘anti-addiction’ effect. For people addicted to heorin in particular, ibogaine allegedly could potentially work medicinally, as it is supposed to alleviate withdrawal symptoms. Voacangine and voccamine are said to possess the same effects. There is little scientific proof in support of these claims. The highest concentration of alkaloids in Voacanga is found in the seeds: approximately 10%. These seeds can be ground with a pestle and mortar to produce a powder that can be taken orally. For a mildly stimulating trip, you’ll need about 50 seeds. High dosages can induce hallucinations. The Voacanga Africana tree can grow up to 6 meters tall. It’s characterized by its long, oval, green leaves, and grows white or yellow flowers. The Voacanga Africana was originally found in African rainforests. Hence, the tree is used to warm, wet environments and very sensitive to drought and frost. Voacanga Africana thrives in soil rich in compost. To cultivate the tree, the seeds will first need to germinate. To start this process, it is recommended to soak the seeds in vinegar for about 5 minutes, causing the hard shell around the seeds to dissolve. Then, rinse the acid from the seeds and sew them about 6 centimeter deep in a deep pot filled with 3 parts of sand and 1 part of putting soil. Water the seeds very day. You might need to use some fungicide to prevent mould infections from developing. It can take up to a few months for the seeds to finally germinate.